So, we apparently forgot to tell you this: we have signed on with the Vancouver Courier, clearly the best newspaper in Vancouver. Also, happy belated birthday. We forgot that too. The blog can now be found at http://www.vancourier.com/pass-it-to-bulis. Alternately, you can just bookmark http://passittobulis.com, which should always lead to the right place. 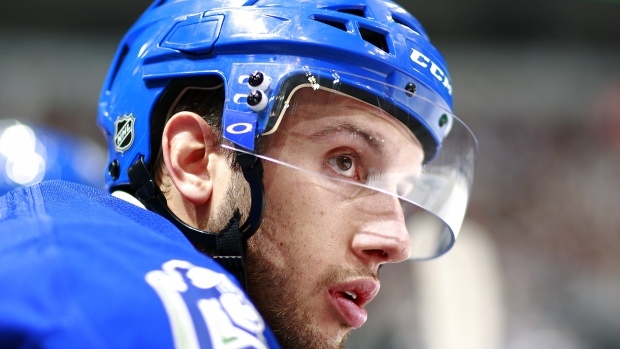 Canucks fans have had to cope with the loss of several fan favourites this season, so it was nice change of pace when the team announced on Tuesday that they had traded Nick Bonino instead. Save for two weeks in late October, when we entertained the idea that he was better than Ryan Kesler, the man he replaced, Nick Bonino didn't accomplish much in his time in Vancouver. And in the playoffs, he was arguably Vancouver's least effective player. It was enough to wish that Jim Benning had a do-over on the deal. Benning must have felt the same way, which is why Bonino is outbound, and centre Brandon Sutter, now formerly of the Pittsburgh Crosbies, is the newest Canuck. Sutter was, you may recall, the centrepiece of a collapsed trade deadline deal that would have sent Ryan Kesler to the Penguins. But, alas, time travel comes at a cost. Doc Brown warned us about paradoxes; Trader Jim didn't listen. The full deal sends Nick Bonino, Adam Clendening and a second-round draft pick to Pittsburgh for Sutter and a third-round pick. The Canucks' goaltending depth took a hit this off-season, as they traded Eddie Lack to the Carolina Hurricanes and chose not to qualify RFA Joacim Eriksson after he signed in the KHL. Meanwhile, goaltender of the future Thatcher Demko will head back to Boston College in the Fall and is at least two years away from competing for a job in the NHL. Though the Canucks still have Joe Cannata and signed journeyman Richard Bachman to compete for starts in the AHL, they could still use another goaltender to start in the ECHL and step up to the AHL in case of injury. That makes the goaltenders the most interesting group of invitees. There's a real need for another goaltender in the system and these invitees represent a cheap and easy way to plug that hole. This is the final instalment of invitee profiles, having already covered the forwards and defencemen. Here are the four free agent goaltenders invited to development camp: Matt Ginn, John McLean, Jackson Whistle, and Clay Witt. PITB's annual look at the invitees to the Canucks' development camp continues. Yesterday, we looked at the defence; today, it's the forwards. Once again, there are two 21-year-olds from the NCAA -- Matthew Lane and John Stevens -- and a teenager from the CHL, this time a 19-year-old from the WHL: Reid Gardiner. Eddie Lack was a fan favourite in Vancouver for a few reasons. His on-ice play had a lot to do with it: he twice came into difficult situations to be the team's starting goaltender and performed remarkably well. But where Lack will be missed the most is off the ice. Lack is an entertaining personality and a great person: his cheerful smile masked his competitive nature. His calm demeanour seemed ideal for a tough market like Vancouver. Then there was his oddball goofiness: the side of him that would put Swedish Chef on his goalie mask, tweet emoji-filled overtures to Roberto Luongo, and do a silly dance after every win. Lack is a big loss for Canucks fans on the entertainment front, but there is some good news. There's another goofy goaltender on his way to Vancouver: Thatcher Demko. The Canucks 2015 development camp is in full swing, which means it's time for PITB's annual look at this year's invitees. Let's start with the defence, featuring two 21-year-olds out of the NCAA and an 18-year-old out of the OHL: Matthew Caito, Rob Hamilton, and Justin Lemcke. Spitballin’ (or Super Pass It To Bulis: All In, if you love adventurous acronymizing) is a feature that allows us to touch on a multitude of things really fast, because in the world of hockey, there are always lots of things to find and colour. Here are a few quick topics. The Canucks released the first video of the prospects in action at this year's development camp and it's a combination of fun and cringe-inducing. Keeping Track of Puck Battles: Can Puck Strength Be Quantified? Pass it to Bulis is the hockey blog that knows who needs the puck. Without spaces, it's also our e-mail address. Have stuff to say? We want to hear from you. Talk to us at passittobulis [at] gmail.com.